A lot of folks seem to be interested in how to “interview” people for Jobs-to-be-Done projects. It doesn’t matter if they are UX projects, marketing projects, or market strategy projects, there has to be a distinct purpose behind such an interview. Some market researchers look for “ah ha!” moments that make it clear what needs to be done. In JTBD, however, we are trying to build a stable model, through interviews, that describes a market, and reflects how that market defines value. Once we’ve built such a model around the core jobs people are trying to get done, we can use it to inform the enterprise from end-to-end (market selection, solution concepts, business requirements, demand generation, etc.) so they can play their roles more effectively than their competitors. But that’s for another day. Before we get started, here’s a quick review of definitions you should be familiar with. To learn more about the language of innovation, check out the blog post I’ve linked to at the end of this section. Job to be Done: A task that people are trying to accomplish, a goal or objective they are trying to achieve, or a problem they are trying to resolve. A well crafted job statement describes precisely what people are trying to accomplish or achieve in a given situation. A job can be functional with emotional components or associated with product consumption (consumption chain jobs). A job is not an activity, since activities are solution-centric. Job Executor: This is a person (part of a larger group) who is trying to get a core job done. They ultimately hire solutions that help them get the job done better and/or more cheaply. Market: A group of people (end users) and the core functional job or jobs they are trying to get done. Parents (a group of people) who are trying to pass on life lessons to their children (the Job-to-be-Done) constitute a market. Dental hygienists who clean patients’ teeth, and farmers who grow a crop also constitute markets. Market Segment: A group of job executors who have a unique set of under- or overserved desired outcomes. They often struggle in a unique way to get the job done because they execute the job in a unique situation or circumstance. Job Map: A visual depiction of a functional job, deconstructed into its discreet process steps. Unlike a process map, a job map does not show what the customer is doing (a solution view); rather, it describes what the customer is trying to get done (a needs view). Desired Outcome: A metric that customers use to measure the successful execution of a functional job or a consumption chain job. Synonymous with customer need. Please keep in mind that the interview is not the center of the method. It’s simply a first step — one of many powerful steps — in the process of targeting predictable success in for innovators. Due to the severe formatting limitations of Medium, and the desire to capture feedback and improve this guide over time, I’ve opted to share this as a Google Doc and forego any of the SEO benefits of the keyword rich document. So, I hope you’ll share it to spread the word to all of your Jobs to be Done friends. Feel free to add comments at the bottom of this post as the Google Doc is view only (no commenting). 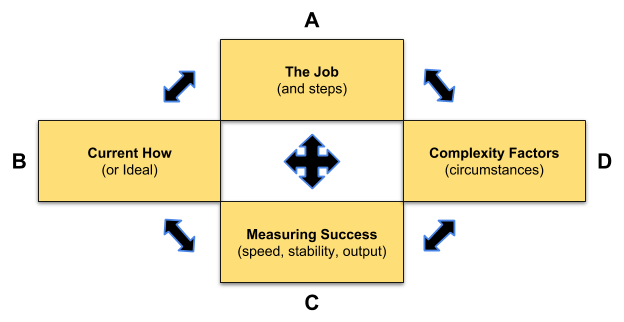 A framework for Jobs to be Done Interviews was originally published in Transforming Customer Experience with Jobs-to-be-Done on Medium, where people are continuing the conversation by highlighting and responding to this story.